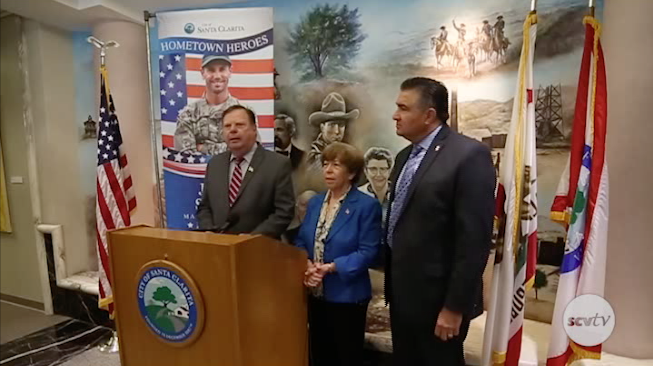 The city of Santa Clarita has launched their Hometown Heroes Military Banner Program. Mayor Bob Kellar led the press conference Tuesday morning with fellow City Council members, describing what the program is and how it is expected to work. Through the program, actively-serving military will have the opportunity to have one streetlight pole banner hung in one of the major streets in each community of the city of Santa Clarita. The program is open to the entire Santa Clarita Valley and the flag will feature the person’s military photo, name, rank and branch of the military they are serving in.